The days of my boy wearing bow cute little bow ties for Easter are over, at least until they randomly come back in style and he chooses to wear one on his own. 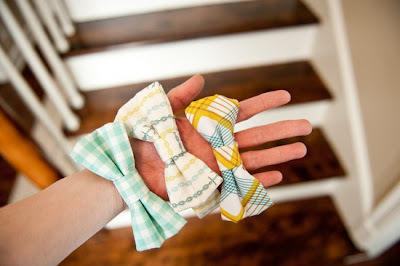 But if you have a little guy that would look perfect in an Easter bow tie, you can see the great pictured tutorial over on Papernstitch. And if you only have little girls, I think these bow ties would be cute clipped to a headband too! I just might have to make this for the 2 year old before Easter. I need these by Sunday. Uh-oh!